Forest ecosystems cover about 40% (397 Mha) of Canada's surface area and play a major role in providing sustainable water resources and healthy environments for communities in cold regions in Canada and across the world. A large portion of these forests (230 Mha) has traditionally been managed or harvested for wood production and resource extraction – practices which can impact regional water resources. Forest management has evolved from stand replacement practices to reduced disturbances such as thinning or regeneration enhancement methods. The impacts of these partial canopy disturbances on processes affecting energy, carbon and water balances are challenging to observe and quantify. In addition, climate change and extreme weather events introduce additional stresses that can impact forest growth, composition, water budgets, resilience and overall survival. In southeastern Canada, large population centres and industrial, municipal and agricultural land use activities put a strain on forest ecosystems and local water resources, which will be further complicated by future climatic changes. (i) Conduct multi disciplinary studies by integrating eddy covariance flux, forest inventory, tree ring, stable isotope and ground and airborne remote sensing data sets to improve our understanding of eco-hydrological processes in managed forest ecosystems in southeastern Canada. (ii) Explore sustainable development of water resources in these forests and improve their resilience to negative impacts of future climate change. (iii) Develop the next-generation of processes-based ecosystem models to enhance our predictive capabilities for cold regions processes. 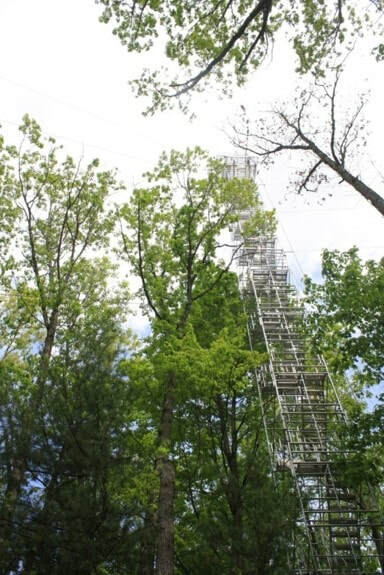 Energy, water and carbon flux measurements are being made using closed-path eddy covariance (EC) systems at four forest sites (78-, 43- and 15-year old conifer and 80-year old deciduous forest). All four stands are located in close proximity, near Lake Erie in southern Ontario, Canada and are known as the Turkey Point Observatory. They are also associated with the Ameriflux, global Fluxnet and NASA ABoVE networks. EC systems consist of a CSAT3 sonic anemometer and LI-7000/LI-7200 gas analyzers that are installed at the top of scaffolding towers. All four sites are equipped with A/C power and internet. Weather variables, soil temperature and moisture, biometric variables (e.g tree height, stem diameter, litterfall) at all four sites (at 2, 5, 10, 20, 50 and 100 cm depths) as well as sapflow at the 78- and 43-year old sites and Soil CO2 emission at three older sites are also being monitored. These measurements will help to examine ecophysiological response of forests to changes in environmental conditions. Greenhouse gas (CO2, CO and CH4) concentrations will also being monitored at the deciduous site by Environment and Climate Change Canada (Dr. Doug Worthy) to provide regional (North American) information on carbon sources (energy sector, waste, agriculture and wetlands) and sinks (forest and agriculture) using invers modelling. 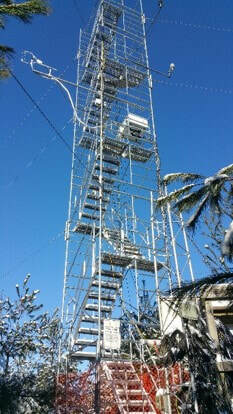 Turkey Point observatory is part of WMO Global Atmospheric Watch (QAW) programme. Objective is to assess the impact of management (thinning) on water, energy and carbon budgets in forest ecosystems. 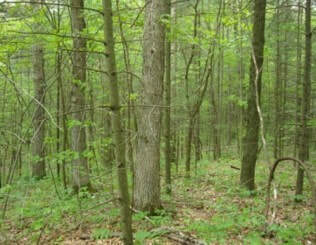 Partial thinning (30% tree removal) was conducted in the 78-year forest in 2012. 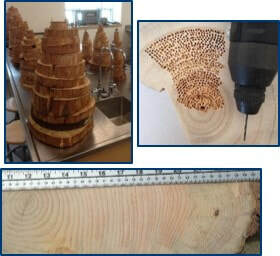 Effects of past droughts and other climate events will be evaluated using harvested stem discs and increment cores from live trees. Canopy physiological (chlorophyll, florescence, leaf area, photosynthesis capacity-Vcmax) measurements at all four forest sites will also be conducted. Changes in leaf area index (LAI) and forest characteristics will be monitored using ground based measurements and drone-based infrared imagery in all four forests. Measurements of Normalized Difference Vegetation Index (NDVI), photochemical reflectance index (PRI) and canopy hyperspectral indices at our sites (conducted by Drs. Chen & I. Ensminger, U of Toronto) will also be utilized. Leaf-level chlorophyll and fluorescence measurements and concurrent canopy-level hyperspectral measurements will also be conducted. They will help in developing remote sensing algorithms for retrieving leaf chlorophyll content and Vcmax. We plan to conduct elemental analysis (e.g. K, Mn, Cu, Fe, Zn, S) of tree-ring growth records using a high-resolution X-ray fluorescence spectrometry core scanner to determine changes in tree nutrient levels and availability in the ecosystem. These records will be compared statistically with tree growth rates and with regional climate records from the same period to determine possible correlations between nutrient levels and climatic (e.g. temperature, precipitation) and hydrologic (soil moisture, water table height) variables at the site (Boyce). We are evaluating changes in growth and water use efficient over the lifespan of our forests (all four sites) by conducting stable isotopic (12C, 13C, 16O, 18O) analysis from annual growth of tree-rings. 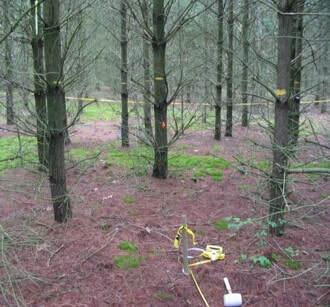 The isotope measurements will be cross compared to available climate records and eddy covariance data (2003-2020) to identify the effect of climate variability and extreme events in these plantation stands. 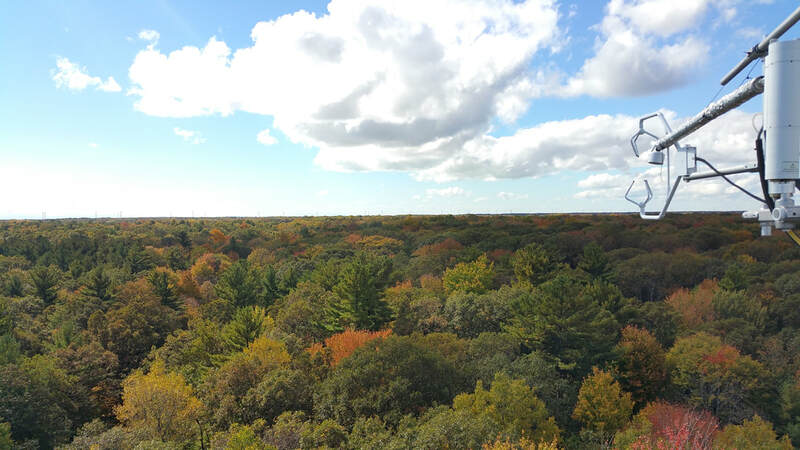 Evaluating the response of these forests to changing climate over their life cycle will help forest managers and conservation authorities in developing management strategies to enhance their resilience to climate change and extreme events and conserve their water resources (Slater, Kim, Pisaric). In 2013, OMNRF-OFRI established 20 Variable Retention Harvesting (VRH) or thinning treatment plots (1 ha each) at our 78-year old site. These VRH treatments include 5 different sets of harvesting densities and arrangements, each replicated 4 times (Fig. 1): A reference, non-treated control treatment plots (CN), partially harvested plots that have either 55% or 33% tree canopy retention with two different spatial patterns, either uniformly distributed (D) or aggregated (A - retention in 4 circular patches of different radius), resulting in the five treatments: CN, 33A, 55A, 33D and 55D. We are monitoring the survival and growth of remaining trees in each VRH treatment block and provide estimate of each treatment block’s net primary productivity (NPP). We are also monitoring below canopy energy water and carbon fluxes as well as radiation regime, soil temperature, soil water content and snow accumulation (snow surveys) in each VRH treatment. We plan to use ultra-high resolution spectral thermal imaging of the VRH treatment plots using drone (UAV) system with the help of Natural Resources Canada - Canada Centre for Remote Sensing (CCRS) to determine variations in radiation and energy balances among VRH plots. These radiation and energy balance estimates will help to determine difference in water balance among VRH treatments. These studies will help to determine how residual stand fluxes stand structure, radiation, soil temperature and soil water regimes differs among the various VRH treatments and which of these VRH treatments promote higher forest growth and productivity. We will determine how the different harvesting intensities and residual patterns respond to climate variability. These studies will help to determine how thinning improves forest resilience to drought by improving stand water availability and water use efficiency. We will also focus on evaluating how the results of experimental VRH can be generalized in their applicability for forest growth enhancement, resiliency, and restoration in various regions in Canada and internationally. We have developed a C and N coupled model, CLASS-CTEM+N and evaluated its performance at local- (>30 flux sites) and global-scales to determine the impacts of climate change and N feedbacks on vegetation ecosystems (Huang et al., 2016a; Huang et al., 2016b). CLASS-CTEM is used in the Canadian Earth System Model (CanESM) to model land surface processes. We plan to improve plant hydrodynamic formulations (e.g. canopy conductance, transpiration and soil water stress controls) and hydrologic regime of CLASS-CTEM+N. We are incorporating interflow subroutines, developed by Environment and Climate Change Canada (ECCC) researchers (Drs. Pietroniro, Davison, Fortin) in the CLASS-CTEM and evaluating their impact on the simulation of evapotranspiration, infiltration and the soil water balance. We are integrating CLASS-CTEM+N and Modélisation Environmentale Communautaire (MEC) - Surface and Hydrology (MESH) mdoels to develop a coupled ecosystem and hydrologic modelling system. Improved CLASS-CTEM+N as well as coupled CLASS-CTEM+N-MESH model will be used to conduct catchment scale ecohydrologic studies in selected watershed to evaluate the impact of climate change and extreme weather events on water resources and ecosystem services. This modelling framework will also be applied for synthesis modeling studies using data from other GWF projects to explore ecohydrological responses and the resistance and resilience of different forest types to climatic stresses at Pan-Canadian scale. We will evaluate forest management and Variable Retention Harvesting (VRH) treatment impacts on the growth and water budgets of forest sites of the Turkey Point Observatory using the BEPS model (Chen et al., 1999). We will apply BEPS at regional (1 km2 resolution) scales to evaluate climate impacts on water and carbon budgets in southeastern Canada. We will apply this high resolution modelling framework work to up-scale site-level information to other plant functional types at regional and national scales and evaluate the feasibility of similar management scenarios in other regions in Canada. BEPS is already coupled to the regional Global Environmental Multi-scale (GEM) model. 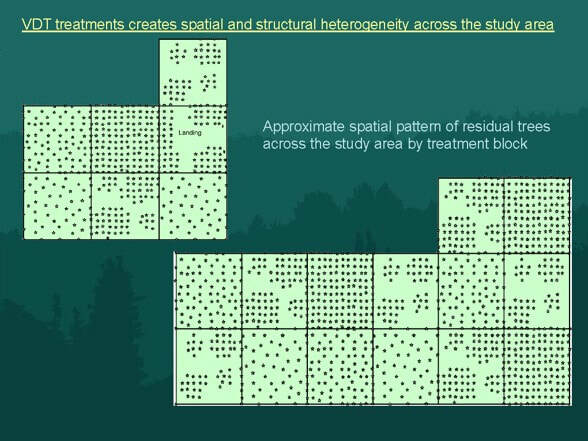 Results from BEPS will be compared with CLASS-CTEM+N applied to VRH treatments to further improve parameterization schemes used in these models and their applicability to forest management and up-scaling studies. 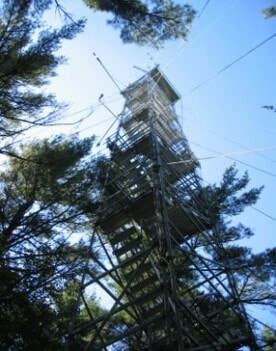 Turkey Point Observatory study sites are located north of Lake Erie in southern Ontario, Canada. They include three eastern white pine forests (Pinus strobus L.) planted in 2002 (TP02), 1974 (TP74), and 1939 (TP39) as monoculture stands and a >90 year old managed deciduous (TPD) Carolinian forest, with predominantly hardwood tree species and a few scattered conifers. These forest lands are owned and maintained by the Ontario Ministry of Natural Resources (OMNR), in conjunction with stewardship from the Long Point Regional Conservation Authority (LPRCA) and St. Williams Conservation Reserve Community Council (SWCRCC) . All four stands are located within 25 km of each other. These forest sites are also known as the Turkey Point Flux Station (TPFS) and has been associated with Fluxnet-Canada Research Network (FCRN), AmeriFlux, global Fluxnet and Global Water Futures initiatives, where they are also designated as CA-TP1, CA-TP3, CA-TP4 and TPD sites. 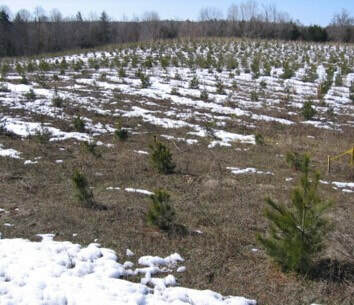 The TP39 and TP74 forests were planted with white pine seedlings on cleared oak-savanna lands, while TP02 forest was planted on a former agricultural land. In 1983, thinning was performed at the TP39 site and in 2012, thinning was again conducted in which one third of the trees were commercially harvested, resulting in a stand density of 321 ± 111ha–1 and reduction of basal area by 13%. 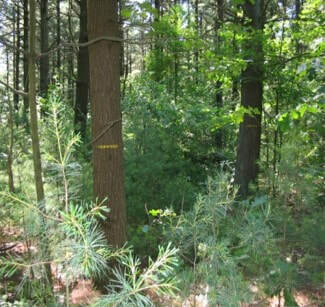 Tree species at TP39 site include >82% white pine and species composition at TP74 stand is 94% white pine. 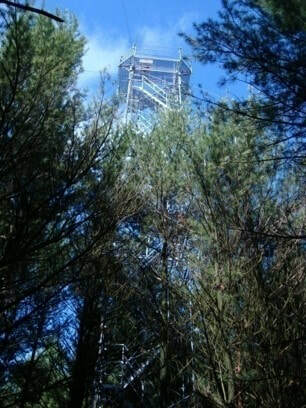 TP02 site consists entirely of white pine species. The dominant tree species at TPD sites is white oak, with other scattered broadleaf species including sugar and red maple , American beech , black and red oak and white ash.